As a first time buyer, it was a great relief to count on Anthony's support along all steps of the buying process. I was impressed with how efficient and thorough he was in every stage from arranging showings to explaining the legal contracts and what to expect throughout the buying process. He takes time to analyze properties and give you his honest opinion about them, and will never push sales. He won't rush you during showings and does follow up calls quickly if he finds out any additional information which might help you decide. He also gets back to you very fast and will make sure you feel like his number one client. I would recommend him to anyone looking for a realtor in Michigan. Julie was easy to communicate with and provided us with all of the necessary information in order to make a fair and competitive offer. We highly recommend her services! Very helpful made the home buying process less stressful. Answered all questions I had and some helpful advice and opinions I will definitely use Anthony for any home buying or selling in the future. Knew what need to be done and was quick about it. All my questions were answered right away which made the buying process easier. Great and friendly guy also. As a first time home buyer, Julie was amazing at helping me through the process. I was skeptical of the validity of needing a buyers agent but I don't know what I would have done without her. The fee was tiny compared to what I gained in making the right decisions while looking for the perfect home. She had good eyes on the market and a knack for noticing nuances regarding behind the scenes concerns I could have never known. I will be sending any friend of mine her way. Anthony went above and beyond throughout our entire selling and buying process. From keeping us updated during the open houses on our home, to getting us in for a last minute second look showing on a home we wanted to purchase, to answering the many questions I had in no time at all - he is fantastic to work with. Highly recommend! Anthony has been a pleasure to work with during this frustrating time of trying to find a house. He was very understanding and helpful in what we were looking for in a house. We would highly recommend him to anyone. Julie was able to find a house that we were able to turn into our home. She was always welcoming and open to our ideas. We looked at many different styles and neighborhoods. So helpful kind and wonderful communicator. She always had a smile and whatever we needed she was there. Not pushy at all but on top of getting you through the process. By the end she felt like a friend! Julie was wonderful to work with and very helpful in all aspects of our searching for a new home. She was always prompt in responding to our questions and finding properties to view. Very personable yet professional. We are moving from Michigan to Florida and Anthony has literally been our "eyes " during this entire situation. Anthony went above and beyond to find us our new home. He contacted us several times a day whenever he found something he thought we might like. He would FaceTime with us through the homes and be available for phone calls whenever necessary. Anthony has made this experience as stress free as possible. Even though we have never actually met Anthony in person we feel as though we already know him. We are completely confident in our decision in choosing our new home and the work that Anthony has done for us. Thank you Anthony for a Job Extremely well done !!!!!!! Julie is a down to earth pleasant and professional person to work with. She went out of her way to help with any questions and appointments times I needed. Anthony helped us through the daunting task of finding a house while living in another state, and did an amazing job. He worked to ensure we had properties to view on our short visits to Michigan during our search, and even made last minute changes to his schedule to meet with a builder and help us get the offer nailed down. Buying a house is a challenge, add to that being a thousand miles away! Anthony made the process simple and stress free. Julie is awsome!!! Had a great time looking at houses with her, she is very dedicated to her job and clients willing to help them in any way. Julie was good at keeping my husband and I motivated on getting our house ready to sell and very knowledgeable on what we should and shouldn't do. We loved her and will be using Julie on our next purchase!!!! Thanks Julie Tardani!!! I miss you already.. It was really good! I would use her for my next home. There were a few bumps on the buyer side and Susan was there to help us get through them as well as helping retrieve money from when I bought the house nine years ago. My wife and I began our house search about a month ago and we found Anthony through Zillow. We started our search in Allendale, MI and we certainly didn't stop there. 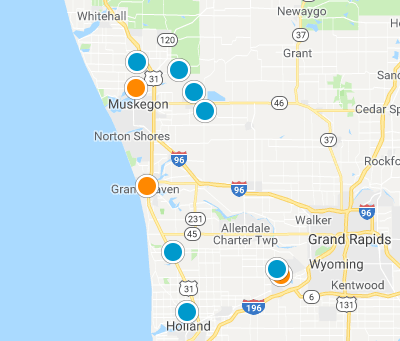 We looked everywhere from Grand Haven to Middleville. We were very blessed to find such an amazing real estate agent, he went above and beyond for us. Not only did he not hesitate to travel across West Michigan with us to find the right home but his knowledge and dedication to us as buyers made the process enjoyable and smooth. He sent us listings everyday and when we found one we liked he had a showing set up that day. No matter the time he was always there for us. There just aren't enough great things that we could say about Anthony, he helped us find our dream home and for that we will be forever grateful. Thank you so much Anthony! You are amazing! If you would like a realtor that sticks with you for the long haul and responds to all of your inquiries, then Julie Tardani is a great choice. She is hungry and does not rest on her laurels. If she does not know the answer she has a great network to pull from and found the answers we need in a timely manner. We couldn't be happier that our original realtor was unresponsive, so that she could step in for the Win! Anthony was very helpful in our home search. He listened to the specific criteria we wanted in a home/property and found us exactly that. He was prompt in responding to contact/questions, very polite and professional. We would highly recommend to anyone who is on the market to buy and/or sell a home (or property). We had a great experience with Anthony. He helped my fiancée and I purchase land for our new home build. There were some ups and downs trying to find the right piece of land but Anthony was there for us during the whole process. He was always available to talk and to help with whatever we needed. He constantly kept us updated with with all the information we needed in purchasing our land. I highly recommend Anthony. We were very happy that we had him as our realtor. Julie has been helping me try find a place for a couple of months or so and she has been great. Its tough for home buyers in this area but she has been proactive and quick to respond the entire time, I highly recommend Julie for anyone home shopping. Anthony has great customer service, and as a Veteran he demonstrates integrity in doing the right thing time and time again. He goes above and beyond for his Clients, he is a pleasure to work with who is very understanding, and I don't think you could ask for anything more from a Realtor. Very nice to work with. She knew what she was talking about. She was very patent. She was dedicated in helping us look for a place to call our own. She pointed things out that was wrong with a place, not just looking to make an immediate sell. She cares for her clients. He was very professional and made sure the home would fit our needs and wasn’t going to cost a bunch of money to repair. Was always willing to show a house I was interested in every time and was always early. I would highly recommend Anthony to anyone looking to buy/sell or even get help or facts on buying or selling a home. These folks are marvelous. Not only do they know their trade, they work very hard on behalf of their clients. They are conscientious, warm, committed, and fun folks. I highly recommend them. Their knowledge of real estate and the social media in selling homes and condos is impressive. For us, they used all of their knowledge with on-ling purchasing to aid us in selling our condo. Anthony's attitude and enthusiasm to find myself and my family the right house for us was greatly appreciated and always present each time we met to view, or develop our purchasing ahreement. He not only receives a 5 star review but he deserves and earned it. Thx ? our home! Anthony is detail oriented. He answered any questions we had and always returned our calls in a very timely manner. He kept us informed throughout the entire process and made sure to take care of us in regard to the purchase agreement and everything following when we finally bought a house. He was thorough and we felt that he put our best interest in finding us a great home for our family. Great realtor to work with! He was very helpful and professional. I would higIhly recommend Anthony. He helped me find a lender, and overall made the home buying process easy. Anthony worked hard to make sure our home buying experience was excellent. He communicated well with our lender and kept us up-to-date on the process. Outstanding to work with! Anthony is a professional that I highly recommend! He did research on properties in the area and gave us informative prices to help us in our search. Once we found the one that we wanted, he immediately did everything necessary in an expedient manner. I would definitely recommend him ! He is trustworthy and dependable! Give him a call! Julie was outstanding! She responded almost immediately to all texts/phone calls. Julie was professional yet emotionally supportive during a very trying process with our lender. She helped us find our dream home and I would absolutely recommend her to anyone! Julie was a pleasure to work with. She was more than willing to go above and beyond, providing us with multiple showings on short notice. When it came time to make an offer she was willing to lend her expertise. When we ultimately made a counter, her advice saved us 8k. Julie has set the bar very high for other agents. Working with Julie and Besteman Properties Group - Remax Lakeshore was a great experience and far exceeded our expectations! My wife and I were casually looking to become second-time homeowners, as we were beginning to grow out of our first home. We were in no rush, until we found a house that we fell in love with. Julie and Susan were able to quickly and efficiently guide us through the process of listing our house in order to be able to close on our new home. With their expertise and guidance, we were able to list our house and sell it above what we were expecting after just 2 days on market, allowing us to remove our contingency and secure the purchase of our new home (we were also competing with a second, matching offer). Julie was very easy to work with, extremely prompt, and always a professional. We would work with Julie again without a doubt, and highly recommend her as an agent. The whole Besteman group was great to work with. Almost all of their associates showed us a home at one point or another throughout our search. Thank you for your help!! Working with Mark and Susan Besteman was a treat! Mark allowed us to pick what days and times worked best for our schedules to tour houses. No matter how little notice we gave him he always pulled through in scheduling a tour! From finding our perfect house, working with a reputable mortgage company, and ironing out the fine details during closing Mark and Susan were there every step of the way. We may have been first time home buyers, but it sure didn't seem like it with their knowledge and skills behind us! Besteman Properties Group are great to work with. They are professional, and they know what they are doing. They helped us find our dream house, and made the process so easy. I will recommend them to anyone I know in the future! I am very impressed with this team. Quick response when returning calls. Always there to help when you have a question, they have great wisdom and prevented me from making bad decisions. I highly absolutely recommend them to family and friends. You will not be disappointed. Mark knew the area very well and responded to my questions much quicker than I thought through the website. If you want someone very professional and thorough with great communication skills, Mark's your man. Mark is a terrifiic person, helpful, honest, caring, sincere, and hard working. He is always available and easy to work with. Everything about Besterman Properties Group is first rate! Top notch!! Thank you Mark! I can not say enough good things about Susan Besteman. I have sold and bought a house with Susan and she was on the spot with everything. If you call her with a question and she doesn't happen to answer please leave her a message and I guarantee she will get back with you that same day with answers to your questions. I have even had lenders praise to me about how organized she is and how she has everything that they need without waiting. She goes far above and beyond her job. I have known for a long time that I wanted to move closer to my son's family. At first we looked at homes I "thought" I wanted, but once I figured out exactly what I wanted we found it together. I started by giving Mark a vague idea of what I wanted. I know I wasted his time for a while but Mark worked with me until we figured it out. Thanks Mark for helping me find my new home. Mark and Susan make a great team. They were very helpful in the buying and selling process, and I appreciated their constant communication. I truly felt like they cared about my family's future and not just about making a sale. Thank You Again Besteman Properties for making things seamless and very easy !!!!!! I feel confident and glad knowing that their is a professional and hard working group that is dedicated in finding our next home, looking forward to that next call from you. The Besteman's are very knowledgeable about the lake shore area, they worked hard to make sure all of my questions were answered. Mark and Susan are great professional friendly people. I will never use anyone else for my restate needs. They truly had my best interest at heart. Mark and Susan were incredibly professional, very task-oriented and up front and honest. Quick to respond to any questions we had and schedule showings. These guys are the bees knees! We listed our parents house in a small, rural town while the market was flat. We had our concerns about what we could get for the property AND if it would even sell. Susan went to work and directed us on small upgrades that should (and did) work. Her attention to detail and marketing expertise helped seal a deal. A great communicator. We never wondered what was going on. She was there from the beginning to the end. And a pure delight to work with. She will get the job done! Susan was with us from the start through the closing and even kept in touch years later! She is an amazing agent who gets deals done and quickly! She was very kind and extremely helpful! Took all the stress out of buying a home! Our family thanks her very much for her dedication! Thank you very very much Susan! Your the best! Susan was a complete pleasure to work with! She was extremely attentive to the things my wife and I were looking for in a house and dialed us right into the house we were looking for! We never felt pressured to make a move and she always looked out for our best interest. She had a wealth of knowledge on the areas we were looking in and we would absolutely recommend her to anyone looking to buy or sell a home! Very knowledgeable of the process and the market, Mark did all he possibly could when we hit road blocks in buying our home, would recommend mark to all friends and family, and definitely will use him again in the future should we decide to sell!! Susan helped my husband and I relocate to West Michigan from Chicago in 2014. She has extensive knowledge about the lake shore and was extremely patient as we explored various neighborhoods and even modified our budget. Her professionalism, enthusiasm, and integrity are remarkable. We not only found our dream home, we enjoyed the process of working with Susan along the way. I would highly recommend her services to anyone buying a home. She worked very hard. Was able to answer all my questions and made the process much smoother by taking care of many tasks like ordering surveys as needed and getting information regarding city regulations associated with the house. Susan was very patient in our long hunt for the right home for our family. She toured several (about 50) homes with us and always wanted our feedback on what we did or didn't like about the home. She always made mental notes on what specific things we wanted our home to have (such as an attached garage, open floor plan, condition of the home, proximity to town, land, etc). She was quick to respond anytime we had a question via e-mail or telephone. If she didn't know the answer, she was quick to find out. She was very informative and reviewed all of the information with us when putting in our offer, and throughout the entire purchase process. We always felt she genuinely cared about us finding a good fit for our family. I have recommended her to anyone I know and highly recommend anyone who is looking for a good experience to contact Susan!